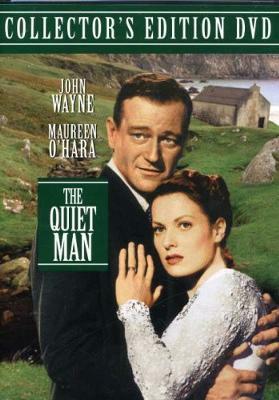 The Quiet Man is about an American (John Wayne) who goes back to Ireland and courts a woman. Excellent scenery, acting, and dialog. I think it was made around 1950. Ages 12 and up would like it best. Nothing offensive. The film was shot on location in Ireland, it also stars Maureen O'Hara as the female lead opposite John Wayne. Directed by the renowned John Ford. Great character actors. Thoroughly satisfying as movies go! That's about all I have unless I would look it up in a movie book or something. It's been 2 years or more since we watched it. We also watched 3 excellent Humphrey Bogart movies this year: The Maltese Falcon, Treasure of the Sierra Madre, and African Queen. All excellent. Wayne, an American boxer who returns to his family's homestead in Ireland. Once there, he meets and falls for a beautiful Irish woman. Her brother disapproves of their relationship, so Wayne goes to the town matchmaker for help in setting up a courtship and marriage deal. They both love each other very much, but a secret from his past threatens to ruin their life together. A delightful and enchanting Irish tale with a big action-packed ending. Speaking of John Ford, he won Best Director for The Quiet Man. This is one of the best films ever made. Guys will like it for the mano e mano John Wayne's character has and the unlikeable brother. Gals will like it for strong female character who has a romantic side played by Maureen O'Hara. There is a great fight seen between husband and brother that, if ever there was a reason to fight, the Quiet Man captures that in the best reason (protecting your wife).